Let’s imagine you’re a large corporation. Let’s also imagine that you’ve taken the plunge to “digitize” your corporate workplace. You’ve purchased new hardware, and you’ve implemented Microsoft’s SharePoint system to create a collaborative, seamlessly functioning digital environment. And you’ve also put your entire staff through extensive training in order to help them properly use the new system. In other words you’ve invested a lot of time and money in this transformation – which also means you have all the things outlined in Gartner’s 8 Building Blocks for the Digital Workplace. Now tell me, was it worth it? Yes, no…maybe so? Is the system helping your employees do their jobs better? Are they getting the information they need, when they need it? Yes, these are all hard questions to answer unless you have a way of analyzing your digital work environment. A system like SharePoint can be great – but implementing it and training your staff to use is just the first step to actually USING it – and using it well. Businesses and organizations that get with the program and take steps to digitize their workplace deserve kudos for their initiative. But just throwing money around to get the best tools isn’t enough. Even the best training and implementation won’t work wonders overnight. The fact is that the digital world of work is a fast-paced, constantly-changing place. Companies who think they can drop a new solution into place and then sit back and do nothing are in for a rude awakening when they find out that their investments in time and money are being wasted. The “agile mindset” that has taken hold in the realm of software development is slowly (or not so slowly actually) moving into the business world as well. Rapid reaction, iterative changes to products and processes, continuous improvement and rolling analysis are the name of the game now. Agile principles centered around continuous improvement are being applied across the business world. These same principles apply to the workplace. Making a success of your digital transformation means embracing the idea of constant improvement. And when it comes to a tool like SharePoint in particular, constant improvement having a way to analyze it and its use. Let’s dive into the details of what this looks like. On-premises servers that host newsfeeds, internal sites, business intelligence applications etc. The sum and substance of all this is that there is A LOT to analyze – from individual sites, to site collections, to the content being shared within SharePoint sites and the individual users who are accessing them. Take the search function of the SharePoint system, for instance. Users who need to find some information, quickly answer a client’s question or locate their team’s schedule, simply type in a search term to jump directly to the correct site or page. An analytics tool for SharePoint gathers data about which search queries are most popular and can give insights into which terms a particular employee searched for. Take another example: content tracking. A team leader uploads a batch of files to his or her team’s page. Each file is meant for a specific team member and is directly connected to a specific task. Analytics for SharePoint can help track downloads across company websites. Analytics will make it possible to tell when each file was downloaded and by whom. It can also track pageviews for the page that hosts the downloads to tell if information was easily accessible or not. Putting this and other data to use is what can makes analytics for collaborative tools like SharePoint an essential part of creating a good digital workplace. First, let’s remember that we are not talking about vast overhaul efforts, but small, incremental changes that can have a significant influence on the effectiveness of individuals, teams and whole companies. In some cases, the insights that are drawn from SharePoint analytics may help improve the sites or content themselves. In other cases they may be used to make personnel decisions, reorganize teams, measure management effectiveness and other areas. Because an improved digital workplace lies at the intersection of BOTH people and technology. SharePoint site administrators have a vested interest in observing the traffic on the most popular sites under their control or lists and libraries connected to them. Part of the reason for this is the need to measure the success of search queries – in other words the path employees take to get to the information they need. Site search keyword reports can show which pages users ended up on after searching. Thanks to this it is possible to determine if users were able to quickly find what they were looking for. If some piece of information is particularly important for a team’s work, but is missing or hard to find, this analysis will help fix that. Since SharePoint is designed to allow teams to collaborate on various projects, share and comment on documents, it is important to make sure that employees are constantly kept in the loop. Collaboration becomes a strength of the digital workplace when companies have clear insights into their collaborative systems. Analytics lets administrators, managers and others track pageviews, libraries and next-actions (after a pageview) such as link clicks, comments, etc. This data can also be segmented by user or department to show which content generates the most engagement and is the most useful. Often it is hard for management to know how employees are receiving company news, initiatives, or changes in policy. Sometimes the effects of one or more of these is different depending on the team or department and may need to be optimized based on hard data. By tracking files and libraries of files based on clicks, open rates, and so on, it is easier to follow a particular department’s engagement with a certain page or other content using custom variables and displaying data in custom dashboards that can be created at the department or campaign level. Now – after all that – let’s imagine that you have come to the conclusion that your digital workplace could use some improving or that your digital transformation isn’t quite a “done” as you thought. Where should you start looking for a tool to do SharePoint analytics? Right here, at Piwik PRO, of course! 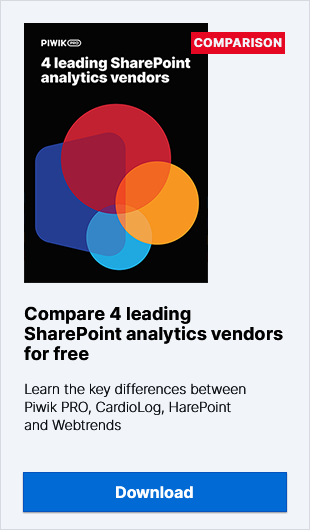 SharePoint Analytics Vendors Comparison: Which Solution Is Right for You?